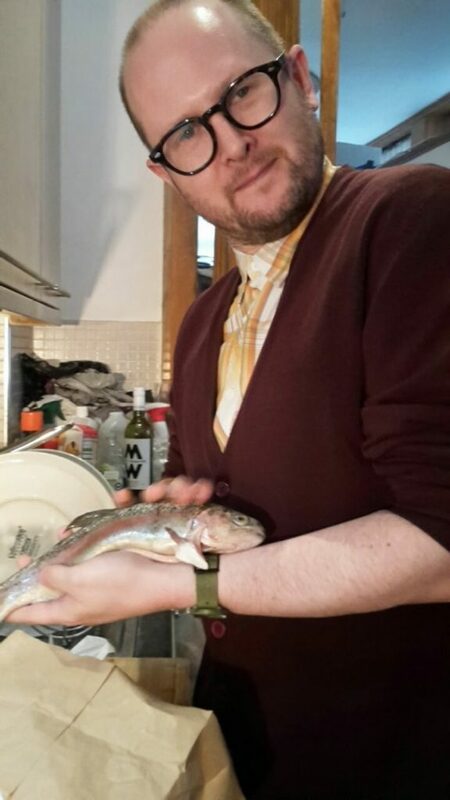 Fishy fishy! 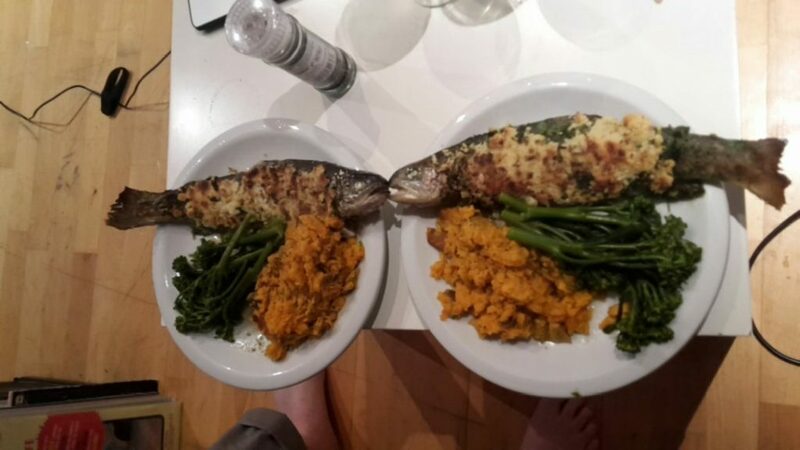 Two households recently enjoyed testing Jack’s excellent trout recipe. One in London, one in Hastings. 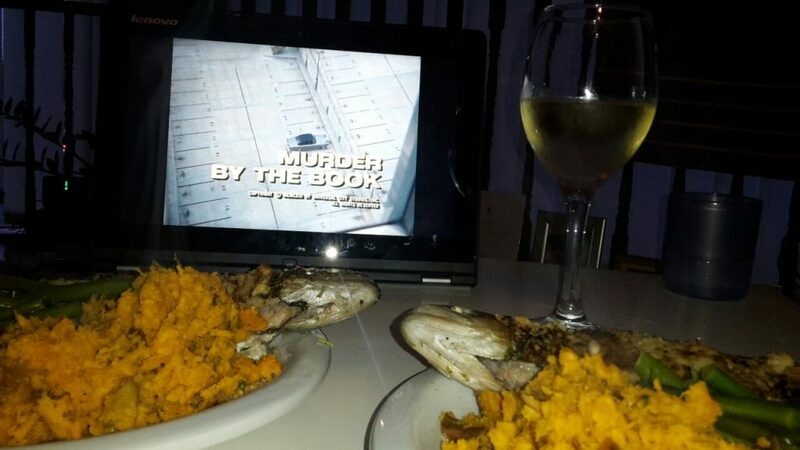 Both sets of diners sent me excellent feedback for the Columbo Cookbook and some photos that made me exceedingly happy. 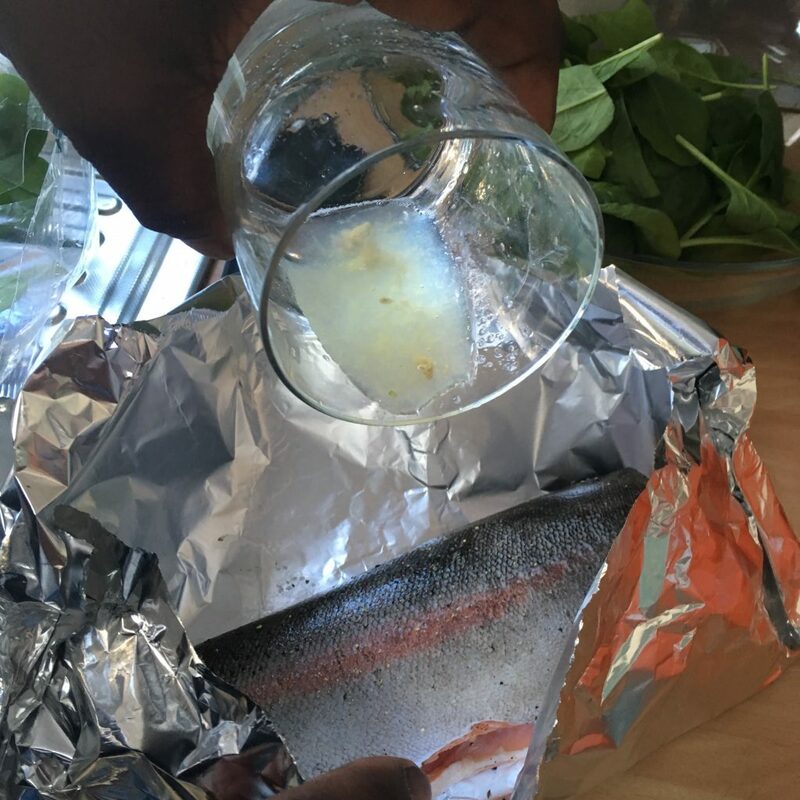 First up – Dylan and Arike sent me feedback and some pictures of a “speccy div and a fish” – Dylan’s words, not mine… Dylan reported back that the recipe was easy and fun to do, plus it made them buy fish from the fishmongers which is a GOOD THING. 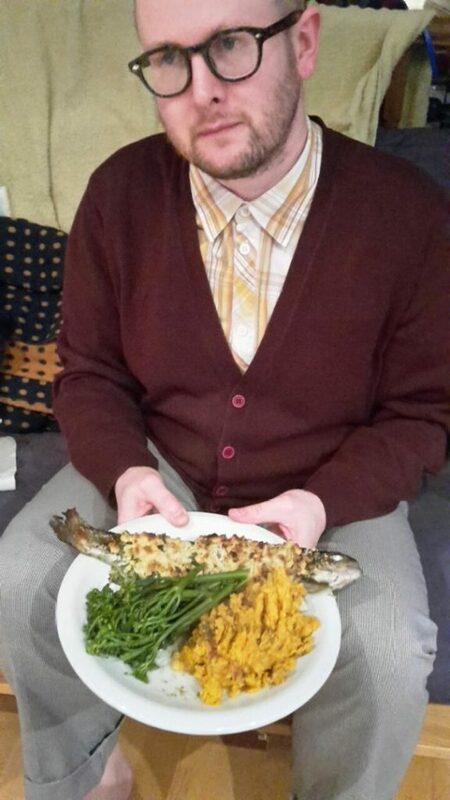 These photos do make me laugh… Dylan loves his fish, and the fish love each other… Kissy kissy! 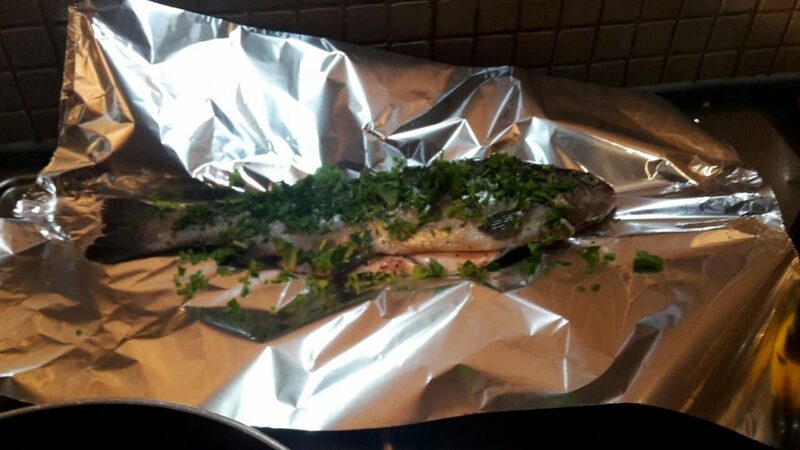 Meanwhile, in Hastings Trix and Lady Jane also enjoyed some fishy fun with this recipe. 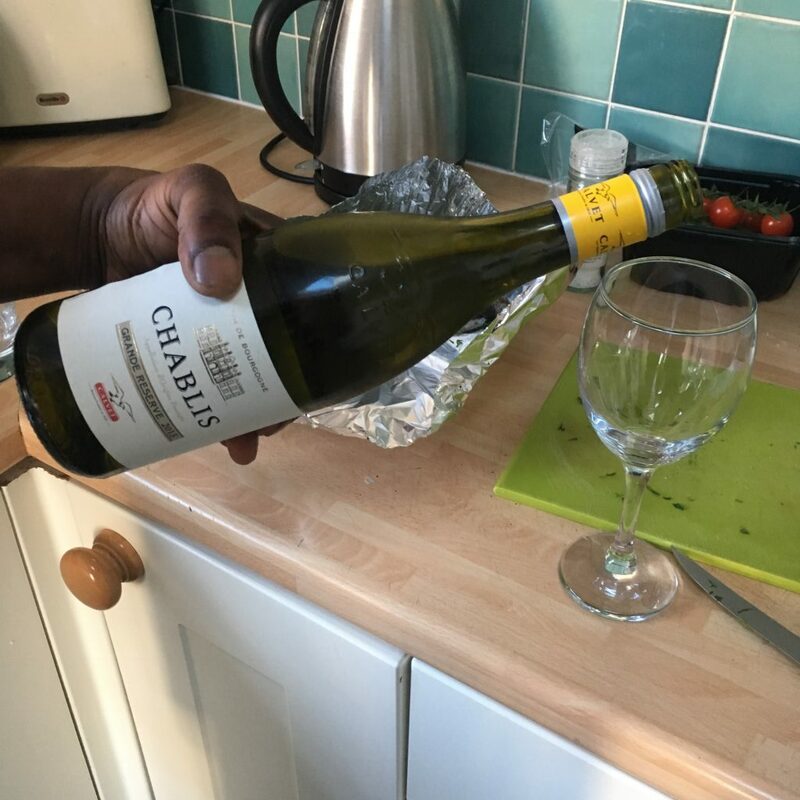 I am very pleased to see that they too took on board my suggestion that as you only need a couple of drops of Chablis for the fish, you might as well drink the rest of the bottle! Ahh, cheers Trix! 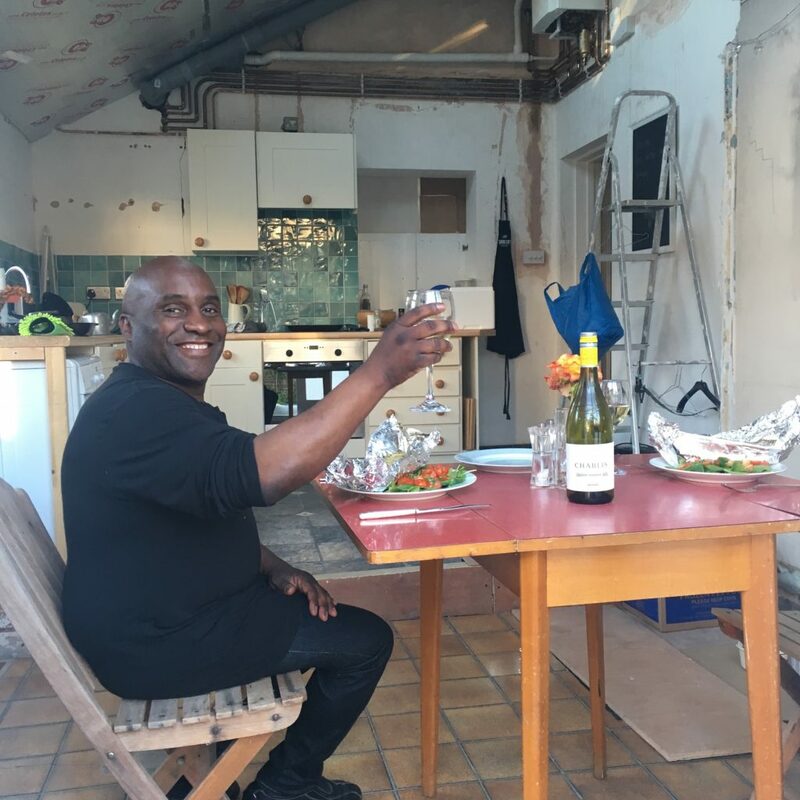 I was sitting in that seaside kitchen with you just a few days ago, I miss it, and you! 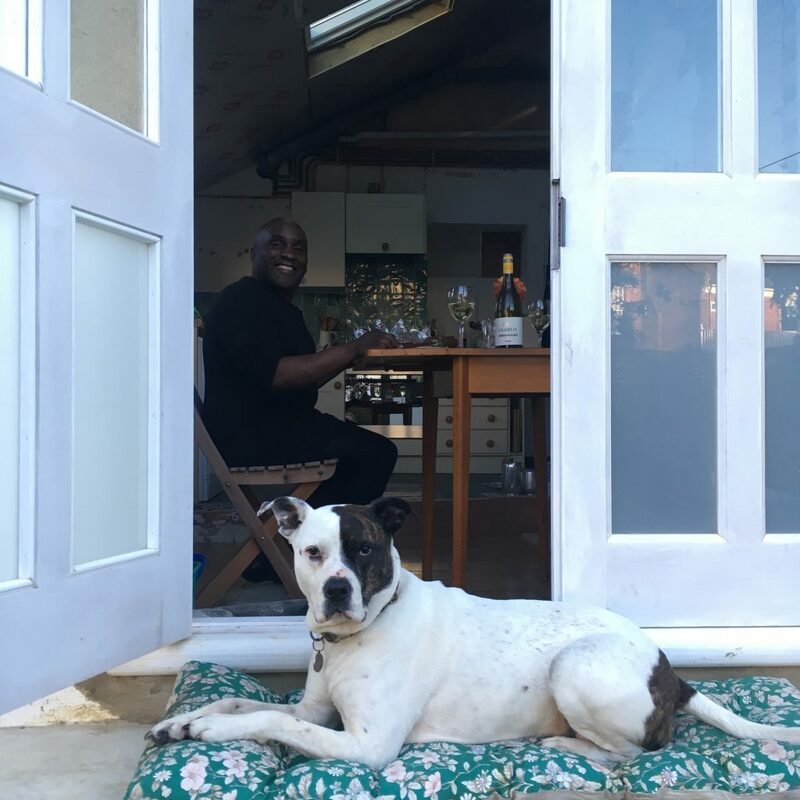 Readers may recognize the doggie Tia from my previous post about Lady Jane – she who “can’t cook, won’t cook”. 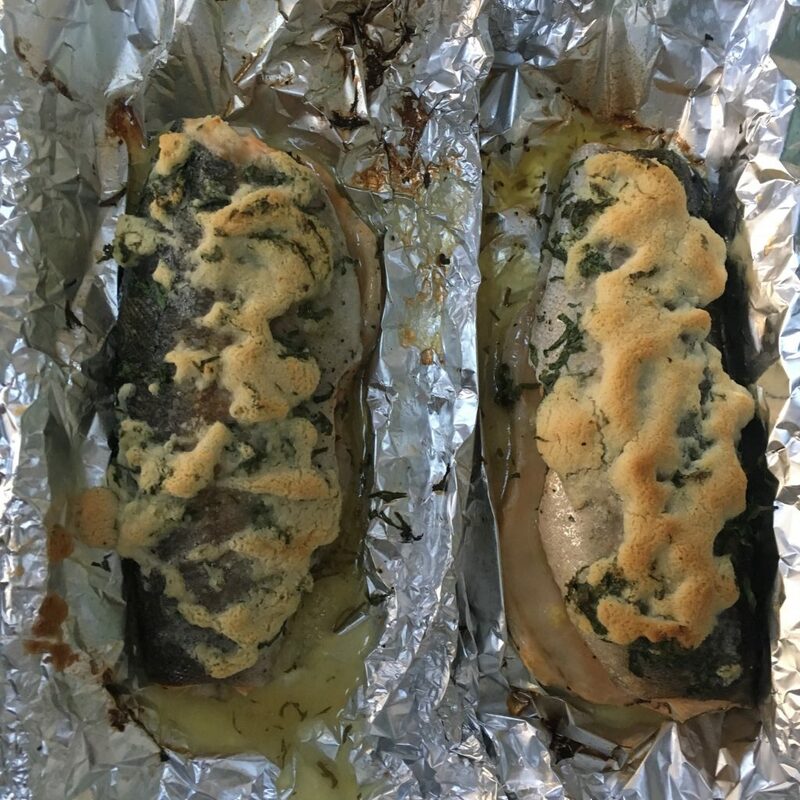 Apparently, during the construction of this trout recipe, Lady Jane offered to help out, weighed the butter then promptly dropped it in the washing-up water. Back to the millinery room with you Lady Jane! 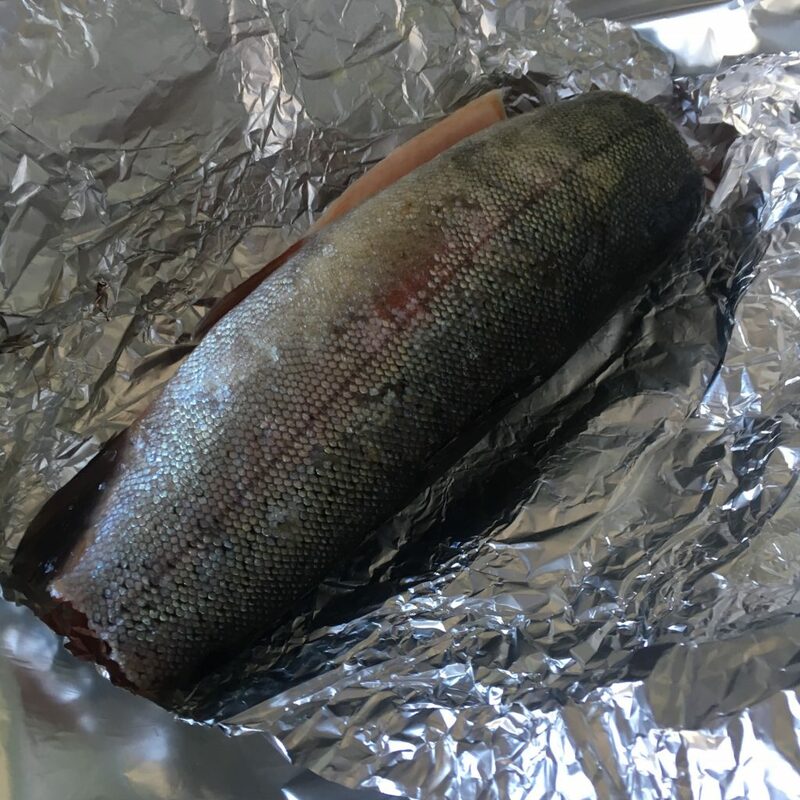 If you’d like to have a go at Jack’s trout yourself, you can find details of how it is done in this blog post – I am going to fiddle around with it for the book as both test cooks pointed out that Jack’s instructions about the topping weren’t very clear. Mmmm. 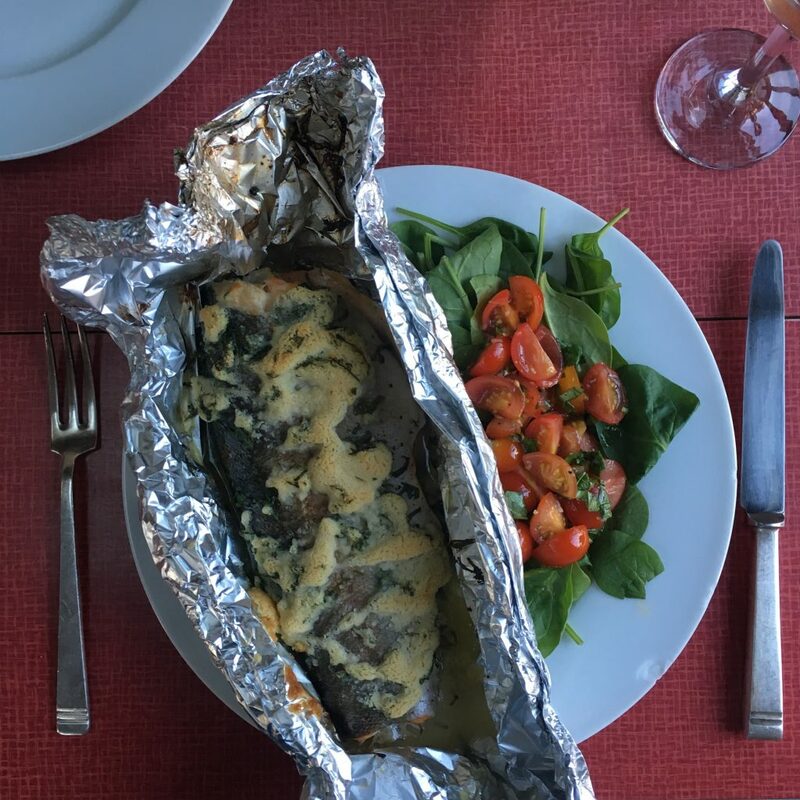 Trout in a Pouch with Chablis! 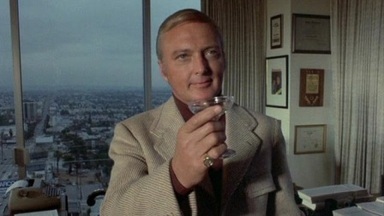 Cheers Jack!